It doesn’t matter whether you’re an executor clearing a house after a death or you are a homeowner that is struggling to get rid of the clutter that accumulates over years of living in a property, clearing a house isn’t something anyone wants to do. Unless you happen to have a lot of clearing equipment and access to transport, a house clearance can be a chore that can feel like it will never end. Luckily, HV Property Clearances offer full house clearances in Helensburgh and beyond, so that our Scottish clients can relax and let our team of experts do the hard work for them. 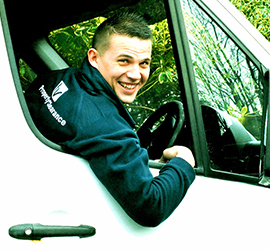 Our team at HV Property Clearances have never let a client down. No matter what your individual situation is, we are prepared to handle it sensitively and efficiently. We understand that doing something like clearing out a loved ones home can be extremely difficult, and we aim to make sure that such an inherently unpleasant task is made as pain free as possible for you. We know that the items we are moving may have sentimental value, and so we take extra care to make sure everything is handled as carefully as possible. If you have a quick look at our testimonials page, you’ll see that our previous clients agree that the work that we do is to a fantastic standard. Helensburgh is less than an hours drive from where we are based, so you don’t have to worry about distance causing any issues. We have experience clearing out houses across the West of Scotland, and have even catered for clients in Edinburgh and Oban on occasion. Our reputation is well established, and far reaching, so we are prepared to travel a reasonable distance to make sure that people are getting the best possible house clearance service on offer. Our full house clearances involve the removal of everything that is not fixed to the walls or floor. This extends itself to carpets and heavy items as well, as we have the equipment and expertise necessary to fulfill this should it be required. You don’t have to provide us with any equipment or assistance; we have it all handled. While we do offer full house clearances in Helensburgh, that’s not the only service that we can provide. We also do uplifts, cleaning services and valuations of items. No job is too big, and no job is too small. We are happy to do whatever it takes to make the lives of our clients that little bit less stressful. We offer a great house clearance service in Helensburgh to both commercial and domestic properties. Not only is it completed to a very high standard, but it is also very fairly priced. If you get in contact with us today, we can offer you a quote and get started as soon as is required.